Being influenced by the news, the EUR/USD pair has broken 1.1800 upwards and may form another ascending structure. We think, today the price may move according to an alternative scenario and grow towards 1.1989. After that, the instrument may fall to test 1.1865 from above and then continue moving upwards to reach 1.2015. The GBP/USD pair has broken 1.2860. 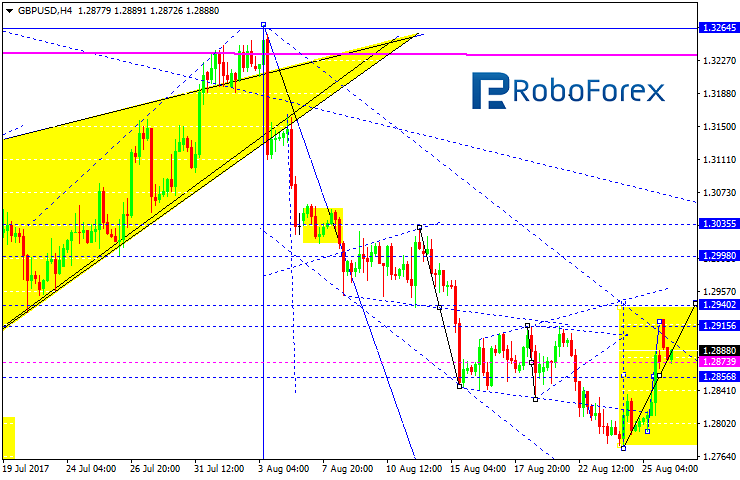 Possibly, toady the price may choose an alternative scenario and grow towards 1.2940. 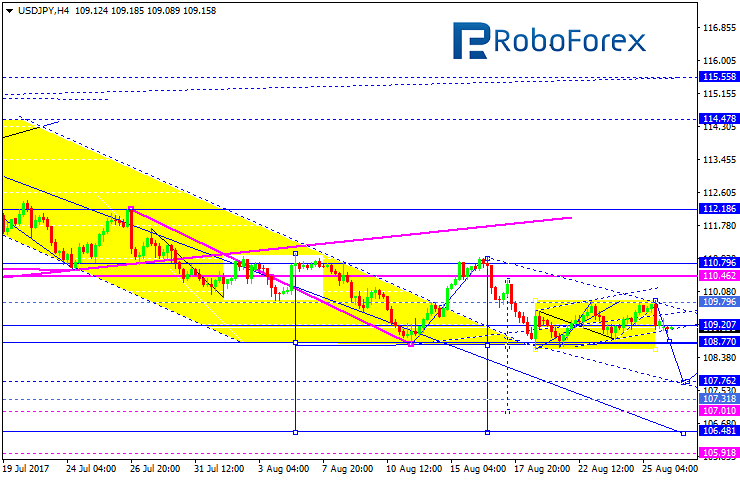 Later, in our opinion, the market may fall inside the downtrend with the target at 1.2732. Being influenced by the news, the USD/CHF pair has broken 0.9640 downwards and may form another descending structure to reach 0.9536. After that, the instrument may be corrected to test 0.9600 from below and then continue falling with the target at 0.9515. The USD/JPY pair has completed the correction in the form of the classic Flag pattern and right now is trading to break the pattern’s downside border. 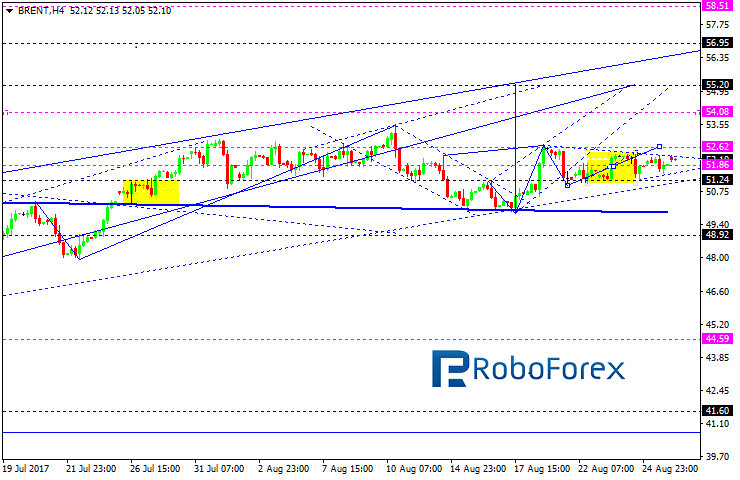 Possibly, the price may fall to reach 107.76 and then test 108.77 from below. Later, in our opinion, the market may continue falling towards 107.00 or even extend this structure to reach 106.50. 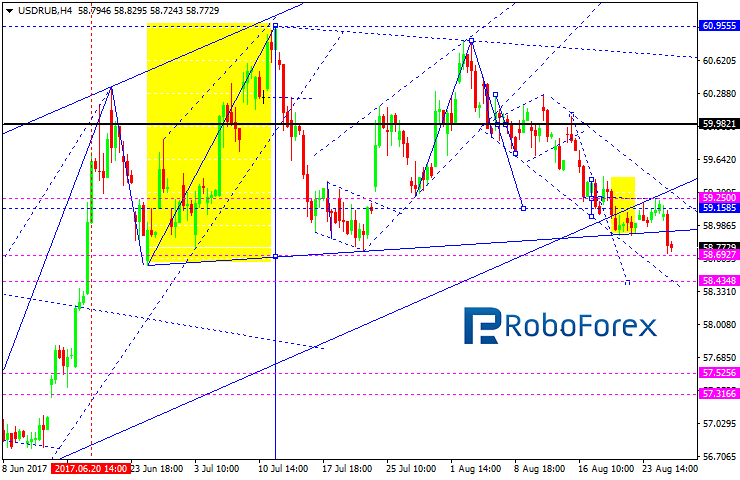 Being under pressure, the AUD/USD pair is trading upwards. 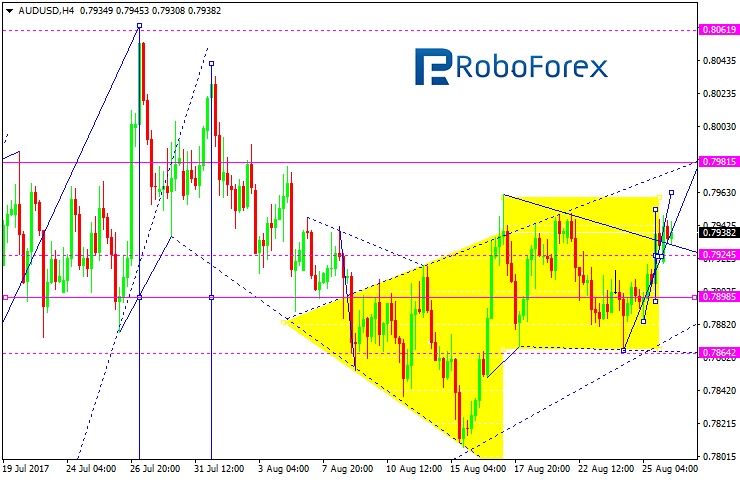 Possibly, the price may form another ascending structure with the target at 0.79815 (an alternative scenario). After that, the instrument may continue moving downwards with the local target at 0.7755. Being under pressure, the USD/RUB pair is falling; this structure may be considered as the third one inside the downtrend. Possibly, the price may reach 58.43 and then start consolidating. Later, in our opinion, the market may break this consolidation range to the downside and continue forming the third wave to reach 57.55. 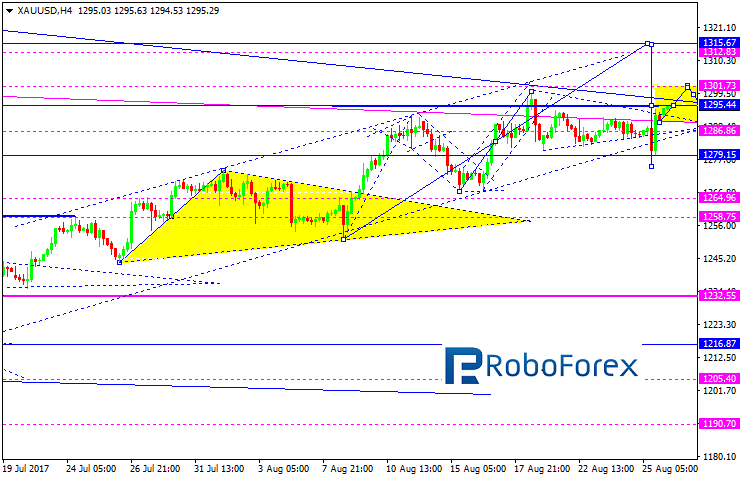 Being influenced by the news, Gold has broken 1288.00 and may yet continue growing towards 1312.80. We think, today the price may consolidate between 1301.75 and 1295.44. 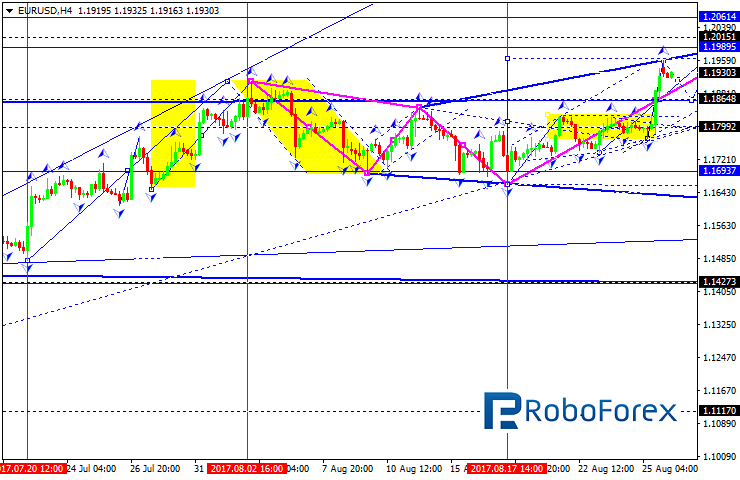 After that, the instrument may break this range to the upside and grow to reach 1312.85 to complete this wave. Later, in our opinion, the market may continue falling inside the downtrend. Brent is trading above 51.86. 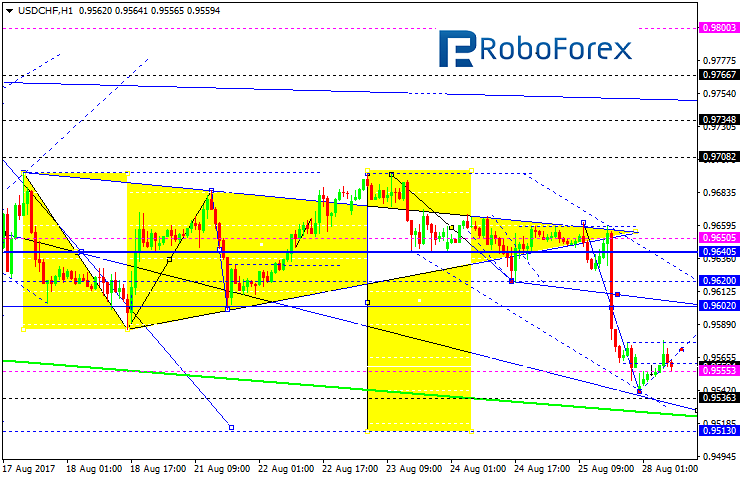 Possibly, the price may grow to reach 52.62 and then start another correction to return to 51.86. Later, in our opinion, the market may continue growing towards the local target at 54.00. The main target of the wave is at 55.15. After that, the instrument may be corrected towards 50.00.